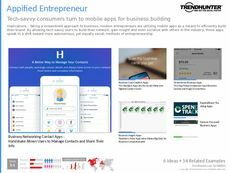 Find Better Ideas, Faster ® with a custom entrepreneurship trend report, our PRO Dashboard and 80+ categories of premium trend reports. The Entrepreneurship Trend Report examines new models of entrepreneurship in the tech era, and analyzes the challenges and opportunities they present to more conventional business formats. 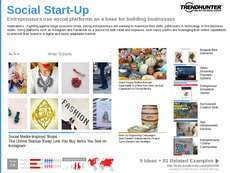 Platforms such as Etsy and Amazon allow small-scale businesses, makers and craftspeople to sell unique, handmade wares online. At the same time, tech start-ups and online businesses can create niche products and services that appeal to consumers because of their artisanal, anti-corporate quality. The Entrepreneurship Trend Report is an extremely valuable tool for professionals looking to found, build and develop their own small businesses. It will provide them with insight into the most successful small businesses and online business models. At the same time, product developers, marketing professionals and retail specialists working for larger brands will benefit from essential information about the competition that small business has come to represent. The Entrepreneurship Trend Report provides an overview of the scope of small business models and start-up cultures, providing important knowledge for both entrepreneurs themselves and the big brands to whom they present a source of competition.